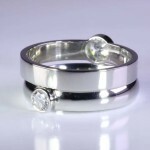 A very fine quality Diamond set in Platinum customised with a flat Band for Men and court band for Ladies. These exquisite rings can be used as wedding rings and also for raising a weak Venus by wearing them in the right hand’s middle finger and left hand’s middle finger. If the native’s Venus is weak, combust, in-active then these rings are especially powerful.